The following text was written and researched by Bob Bonn (thehappyrower@yahoo.com). His original post is viewable here. This photo is of the 1901 Varsity crew of the University of Pennsylvania intermingled with team members of the Dublin University Boat Club. They are posed on the lower lake-front of the Killarney Lakes in front of The Lake Hotel, still in operation since it opened in 1820. Luther J. Smith age 22, ’01 graduate of dental school (coxswain). The narrative below is derived from an excellent history of the meeting of these two teams by Greg Denieffe that can be read here. In 1901 the University of Pennsylvania became the first “foreign” crew to reach the final of the Grand Challenge Cup at Henley Royal Regatta. On their way to the final they beat Thames Rowing Club and London Rowing Club but in the final they had to yield to Leander Club who won by a length in a time of 7 min. 5 sec. Also competing at Henley that year was Trinity College, Dublin University. Trinity entered the Thames Cup and the Ladies’ Plate and was beaten by Eton College in the Ladies’ Cup. The latter lost the final to University College, Oxford by two lengths, the winning time being 7 min. 28 sec. Knowing that the Americans were going to Henley, Dublin University Boat Club wrote to them in May 1901 and challenged them to a 3-mile race in the Killarney Regatta on Lake Killarney, Ireland, on Saturday, 13 July. The challenge was accepted and after the conclusion of racing at Henley both crews travelled together by special train from London to Holyhead en route to Ireland. T.H. Hall says of the visitors, “They rowed in a boat built of papier-mâché and fitted with swivel rowlocks and long slides. Universal admiration was expressed for their strong, erect carriage and swift and vigorous strokes.” The relative times of the crews at Henley made the Americans strong favourites. Trinity replaced their stroke and made a number of other positional changes and dropped their bowman, J.A.W. Johnston. This was all to no avail as despite a gallant effort for the first mile, they were well-beaten by 20 lengths over the 3-mile course. Penn stopped the clock at 16 min. 20 sec. The Irish crew was not as together as their rivals and were certainly not trained to race that distance. Dublin University BC: J. Baker (bow), J. Cunningham (2), F.J. Usher (3), G. Dougan (4), H.A. Emerson (5), A.A. M’Neight (6), E.L. Julian (captain) (7), J.R. Welland (stroke), H.L. Murphy (cox). University of Pennsylvania: R.R. Zane (bow), R.H. Eisenbrey (2), F.L. Davenport (3), S. Crowther, Jr. (4), A.H. Flickwir (captain) (5), G.S. Allyn (6), W.G. Gardiner (7), J.P. Gardiner (stroke), L.J. Smith (cox). Ernest Lawrence Julian (in seated row, wearing a beanie cap), who rowed at 7, was the Captain of Dublin University BC in 1901. He coached Trinity crews for many years after his graduation and rowed himself for their alumni club, Lady Elizabeth Boat Club under the pseudonym of E.L. Souspierre. In 1909, he became Reid Professor of Law at Trinity College, Dublin. In August 1914 this young professor marched to Lansdowne Road and enlisted in D Company of the 7th battalion, Royal Dublin Fusiliers and went on to become one of the first soldiers of the 10th Irish Division to be killed in action in an advance on Chocolate Hill at Suvla Bay in Gallipoli on 8 August 1915. This would appear to be the first visit by an American crew to Ireland. However, an Irish crew had raced at the International Regatta in Philadelphia in 1876. Rowing at Trinity College, Dublin can trace its roots back to 1836, initially through the ‘Pembroke Club’ and then as ‘Dublin University Rowing Club’ (DURC). 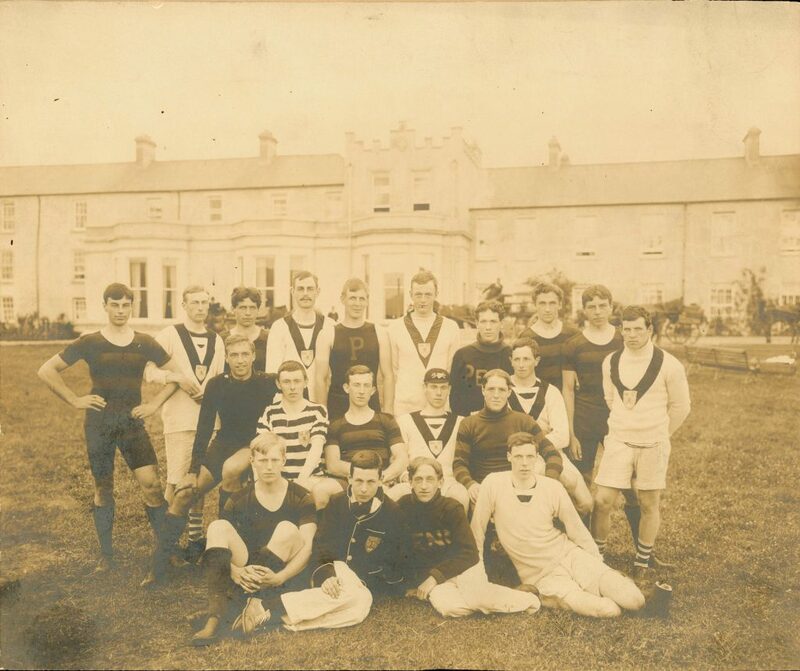 Between 1881 and 1898 there were two clubs representing the university, thanks to the formation of the rival ‘Dublin University Boat Club’. The two clubs finally amalgamated in 1898. It was the ‘Rowing Club’ that finally accepted an invitation to the important regatta being held to celebrate the centenary of American Independence in 1876. They left for America on the 6 August and after arriving in New York travelled on to Philadelphia to compete in the International Four-Oared Race. They were drawn in the first heat against Eureka Boat Club, Newark, N.J. and Argonauta Rowing Association, Bergin Point, N.J. The Dubliners finished second to Eureka by one-and-a-half lengths. DURC were also entered for the International Graduates’ Prize and rowed over having successfully objected to the status of the only other crew entered. The Irish party then made its way to Washington at the invitation of Analostan Boat Club (est. 1866 in Washington DC) and raced at an impromptu regatta. The boat was left behind as a mark of gratitude and donated to Quaker City Boat Club in Philadelphia and may have been used by the first Pennsylvania crew in 1879 which, it was said, was composed of Ellis Ward and his three brothers. It was probably this connection that persuaded the 1901 crew to travel to Killarney.